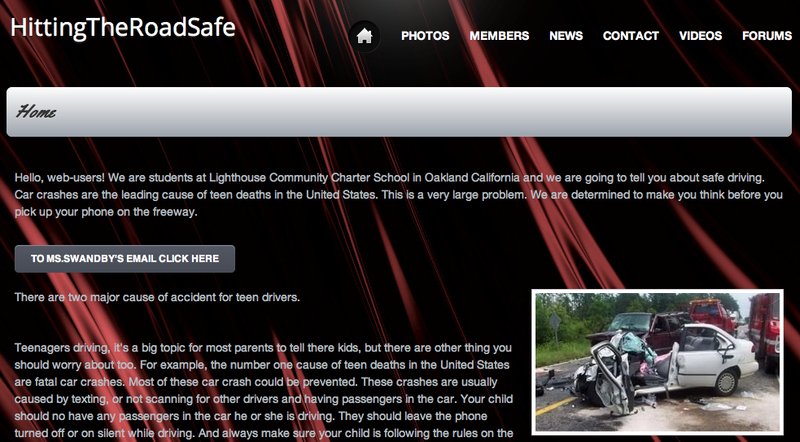 Melanie Swandby, a 7th grade teacher at Lighthouse Community Charter School in Oakland, CA was conducting a service learning project geared toward promoting safe driving habits. Melanie was happy to explore digital content creation with her students, extending her original vision for the project with the goal of producing clear and coherent writing in which the development, organization, and style were appropriate to task, purpose, and audience (CCSS Initiative, 2010). She invited Heather Cotanch and I to explore the use of iPads to create digital products that would resonate with teens and the wider community. We were excited to witness the content creation process which included elements of collaboration, experimentation, and flexible grouping to support peer facilited tech-help. 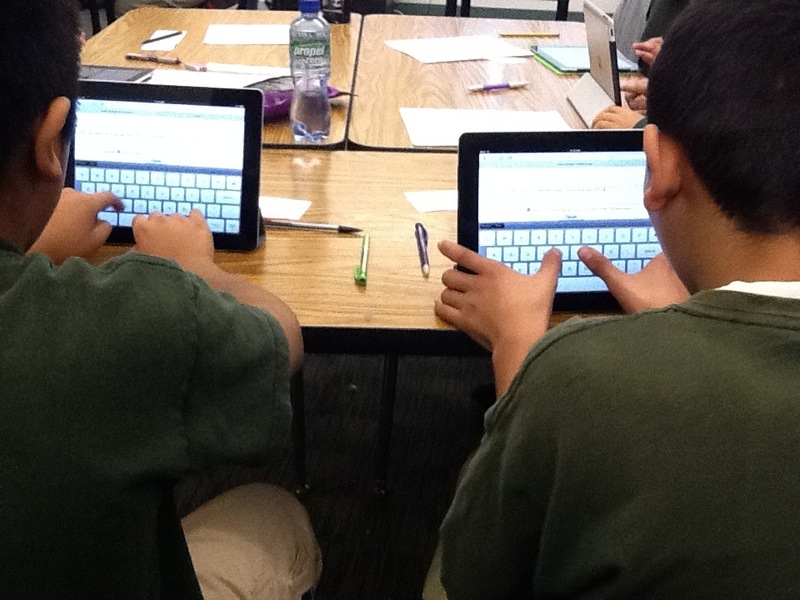 Digital tools are transforming what it means to be literate in today’s world. In the past, it may have been that decoding words on a page was enough to consider a student literate. Today, we live in a world with ever increasing importance on digital tools and technologies as a means of accessing and sharing ideas. Students need to become facile with the full range of communicative tools, modes (oral and written), and media. Having the ability to comprehend, critically respond to, and collaboratively compose multimodal texts will play a central role in our students’ success in a digital information age (Partnership for 21st Century Skills, 2007; IRA, 2009). Melanie’s class worked to actively create projects that resonated with their intended audience without needing elaborate direction with the use of iPad apps. First, we provided a basic overview of the affordances of three digital composition apps (ShowMe www.showme.com, VoiceThread www.voicethread.com, and iMovie for the iPad www.apple.com/ipad/from-the-app-store/apps-by-apple/imovie.html – these three content creation apps were chosen because they allow users to integrate still images, include a drawing tool, and have the capacity to include voice and sound effects). Then, we shared an example product from each app and students were off and running. They soon discovered many features of the apps themselves as they worked. This new knowledge was distributed throughout the classroom as peer support and flexible grouping was implemented. Students completed digital products can be viewed from their student-created website Hitting The Road Safe http://hittingtheroadsafe.webs.com and at Safe Driving VoiceThreads https://sites.google.com/site/swandby/safe-driving-voicethreads and also ShowMe http://www.showme.com under the username jill.castek@gmail.com and password safedriving. iMovie. While using iMovie, students worked in groups and took on different roles such as creators, actors, and editors. Collaboration came in many forms, for example, some students did not want to appear on camera, but were willing to write a script and film a partner. Other groups took turns incorporating found pictures and discussing sequencing to communicate a strong, clear message. Because of the ease of use and multiple options within the iMovie app, the editing process can become never ending. To support a more skilled use of the app, we pointed students toward a YouTube editing tutorial. Students who found themselves with extra time added captions or experimented with the background music offered within the tool. These “extras” gave the movies a professional feel while extending the students’ knowledge of the technology and supportive the processes of reflection and revision. While the iMovie app proved easy for students to navigate, explore, and edit, teachers would be well advised to guide students through ample planning of their project during their first few interactions with this tool. ShowMe. Possibly the greatest successes were achieved with students use of the ShowMe app. Like iMovie, it produces a video, but its affordances allowed students to deliver the most complete, succinct messages of all three tools (student work is available at showme.com under the username jill.castek@gmail.com and password safedriving). During the showcase at the end of the project, the student audience commented on the ability for students to appropriate humor about a serious topic to be showcased. This was achieved through the use of voice, drawing, and integration of selected images. This app has limitations in the amount of media that can be uploaded and may have prompted the students to choose wisely from their options, making the message clear rather than being lost in elaborate visuals. From the first introduction of this app, the students demonstrated an eagerness to peruse the tools and begin incorporating images, drawing and voice together rather than compiling images for a later use (a pattern we noticed with other tools). Even after several projects were lost due to glitches with the system, students simply started over learning from their mistakes, making strategic use of the drafting process, and integrating their new knowledge into final products. VoiceThread. This tool offered the most structured means of conveying ideas and the students took to the tool readily. Once slides containing images were created, they could be moved around as the message was drafted and revised. Once sequenced, students could voice over the visuals to communicate their message. Completed VoiceThreads can be viewed at https://sites.google.com/site/swandby/safe-driving-voicethreads. Students created multiple drafts of their VoiceThread project and practiced their voiceover several times to ensure the tone and quality of the message was spot on. Unfortunately, the VoiceThread interface selectively saved some of voiceovers, which required students to re-create their projects more than once. However, this redrafting wasn’t something students balked at and the message conveyed in each subsequent draft was more extensive, and richer in vocabulary and details. The limits of the technology were not discouraging, but rather a valuable introduction to the process of creating technology-based multimodal products. Students completed projects included a logical sequence but also incorporate personal touches through the use of music, voice, sound effects, and pictures remixed and used in creative ways. By including a specific focus on intended audience, Melanie’s students were readily able to form and frame a persuasive message. For example, students who chose parents of teen drivers as the target audience drew on experiences from their out-of-school lives and combined them with statistics from a school-based text. This resulted in charts and graphs representing percentages, an articulated message free from teenage jargon and pictures free from gore (as opposed to an increased shock value to presentations geared toward teen drivers). Collaboration is key. Collaboration was widely fostered by encouraging students to turn to each other as resources and to help each other figure out how to accomplish their goals. For example, one group of students was using the ShowMe app and wanted include text in their presentation (there is no feature in which students can type using a keyboard). Students offered each other a workaround demonstrating the use the notepad feature and taking a screenshot to import it into the project. Other students offered another option and hand-wrote text on a piece of paper in bold marker and took a picture to import into the project. Still others shared how to use their finger to write the message manually. As was the case here, students often knew what feature that they wanted and found innovative ways to use the app to meet their goals. These observations reinforce the idea that step-by-step instruction by a teacher is not necessary before students use new apps. We discovered taking the time was not worthwhile and may, in fact, detracted from the collaborative and discovery nature of the work and curtail digital competence. Creativity and humor were strategically to convey ideas. As students created their projects, they infused persuasiveness through their use of creativity and humor. Creativity extended well beyond being able to draw well. When asked to reflect on the project, students reported being more engaged in the digital creation process, than the paper and pencil task (even though they needed to develop digital skills quickly to use the tools). They also enjoyed viewing the projects created by other classmates (even though they were very familiar with the content contained within them). Students created multiple digital drafts of their project (and were glad to do so). They appeared to use the multiple drafts to improve the project iteratively. If a student wanted to revise or rethink a portion of the digital creation, the opportunity to do this was manageable as opposed to the static poster version from which the students began. As pairs worked collaboratively, new ideas for improvement were shared amongst partners, which led to subsequent (improved) drafts. Even though students might have stumbled through the first couple of tries, they got better at it each time. Persistence was key! In viewing the final projects, the audience (made up of members of the school and community) found the addition of suspenseful music, images, and the story-lines conveyed through multiple modes generated a tangible impact that was memorable. Witnessing the audience’s reaction interaction was one way that the students owned their success. It was clear that all students felt accomplished and through the act of digital content creation, they became more skilled in the digital literacies that are a vital part of our 21st century world. International Reading Association. (2009). Integrating literacy and technology in the curriculum: A position statement. Newark, DE: International Reading Association. Last week, Jill blogged about a chapter we wrote on developing vocabulary through multimodal expression (Castek, Dalton & Grisham, in press). I wanted to expand on the Vocab Vid strategy (Dalton & Grisham, 2011) and share some examples created by students in my graduate course on adolescent literacy. Their videos “show not tell” the potential of this multimodal word learning strategy. I have also included a handout at the end of the post that you can adapt for use with your students. I’ve learned that some structuring of the process results in more creative and effective videos. The way that I‘ve been thinking about VocabVids is in the form of a short, live action story (30-45 seconds). Language learning is social – we learn with and about vocabulary as we experience it in specific contexts (Gee, 2004). We also know that many students benefit from multimedia learning, especially in relation to vocabulary (Mayer, 2005; Dalton, Proctor, Uccelli, Mo & Snow, 2011). To create VocabVids, students work in small groups to develop a scenario for use of the word, discussing the nuances of word meaning and relationships between words. The planning process involves getting to know the word through initial research with tools such as an online thesaurus and an image search of the term. Students brainstorm a context for the word, asking who, what, where, when and why would this word be used? Skits are improvised, filmed, reviewed, and reshot if necessary. I deliberately have kept the process short – the video is planned and filmed in about 15 minutes – and the product is a live action video that does not involve editing. The final products are presented in class for discussion of the words and digital video skills, with an option to publish to a larger audience on the school website, YouTube, Teacher tube, etc. But what about word choice? I would choose words for different purposes. To begin, you might ask students to select from a list of words that meet Beck and McKeowan’s notion of tier 2 words – words that are important to know and which aren’t part of everyday word knowledge. Or, you might want to open it wide and let students choose their own words, which could be quite specific to their interests, linked to a novel they are reading, or to a unit they are studying in science and social studies. Encourage them to choose a word that lends itself to being acted out (don’t avoid abstract words – they can be excellent candidates). The following 6 videos are posted with permission of the authors who are graduate students in my class, EnEd 3400, Reading and Learning with Print and New Media. I’ve highlighted the targeted word and story context for your information. However, I recommend that you and your students try watching the video without knowing the targeted word to see how quickly you can generate a range of guesses. Use the related words and storyline as clues to engage your students in active word learning. With a coffee cup and the words ‘routine’, ‘pattern’, and ‘customary habit’, Ashley and Meridith illustrate a morning ritual many of us enjoy – drinking coffee. Playing Hide and Seek? As Leah chides Max, it is very important to be ‘discreet’. Since Max is usually ‘obvious’, ‘blatant’ and ‘eye-catching’, will he be able to find a hiding spot that is not ‘conspicuous’? Laura convinces Katie that the spot on her jeans is ‘little’, ‘tiny’, ‘petite’, even ‘Lilliputian’. It is ‘NOT huge’, as Katie fears, but “diminutive”! Personally, I loved the Lilliputian reference from Gulliver’s Travels. Flashing lights and strange noises in the bathroom result in a ‘weird’, ‘spooky’, ‘creepy’, and ‘eerie’ experience for Erin. When does ‘lying in wait’ and ‘peeking’ turn into ‘lurking’?! Yumeng helps Neil understand the difference. Technical alert – this video is sideways, but funny! Why would Russell call his friend a ‘bombast’ and scorn him for his ‘pomposity’ and lack of ‘humility’? Watch ‘braggadocio’ Simon to find out! VocabVid Stories are short (about 30-45 seconds) videos that illustrate the meaning of a word through a short skit. The goal is to situate the word within a meaningful context to help us learn and remember the word. And, you will learn something about designing short videos along the way! 1. Research your word to find synonyms, antonyms, and other related words that you can include in your story dialogue. Don’t forget to make note of different forms of the word. The Visual Thesaurus or other online thesaurus tools are great resources for exploring the meaning of your word. 2. Brainstorm possible contexts for how the word might be used. As you’re brainstorming, think about how you can act out your video skit. Where might you hear this word? Who might be saying it? When is the word being used? Why are they saying it? What kinds of feelings might be associated with this word? 3. Do you need any simple props? 5. Make a sign showing your word in writing (print the word large and clear so that it can be read on screen). You will show this sign at the end of the video. 6. Improvise your skit, giving each other feedback as you go along. 7. Film your skit and review (see the technical advice section on shooting your video and using a Flip camera). 8. Try filming again if needed and select the best one. 9. Share your videos in class and discuss what you learned about these words, as well as what you learned about creating VocabVid Stories. 1. Don’t shoot into the light! (Avoid standing in front of windows). 2. Actors need to face the camera or each other at an angle that still allows them to be seen and heard. It is common for people to turn away from the camera, especially if they are in groups. Watch out for this. 3. Actors need to speak clearly! Be dramatic! 4. Find a quiet spot. Test your volume at the beginning, so you know who needs to be louder or who needs to speak more clearly. 5. Show your vocabulary word on a piece of paper at the end. I have provided markers and paper for you to use. How to Turn Your Camera On: Slide the gray button on the top right side of the camera down. Your camera will automatically turn on. How to Begin Shooting: Hold the camera in the vertical position (otherwise, you will get sideways video!). Press the red button to begin filming. How to Stop Shooting: Press the red button again. There is no way to pause your videos, so you will have to complete them in one take. But, please film a few takes and compare so that you can choose the best one! Zoom In/Out: Press the + button to zoom in and the – button to zoom out. How to Play Videos Back: Press the Play button to the left side of the screen. Press it again to go to the next video. How to Delete Videos: If you want to delete a video, press the trash can twice. ONLY KEEP THE FINAL VERSION OF THE VIDEO ON THE FLIP CAMERA. DELETE ALL OTHER VERSIONS BEFORE RETURNING THE CAMERA to Robin – she will download on Bridget’s computer. Castek, J., Dalton, B., & Grisham, D. (in press). Using multimedia to support students’ generative vocabulary learning. In J. Baumann and E. Kame’enui (Eds.) Vocabulary Instruction: Research to Practice (2nd ed.). New York, NY: Guilford Press. Dalton, B., Proctor, C.P., Uccelli, P., Mo, E. & Snow, C.E. (2011). Designing for diversity: The role of reading strategies and interactive vocabulary in a digital reading environment for 5th grade monolingual English and bilingual students. Journal of Literacy Research, 43 (1), 68-100.